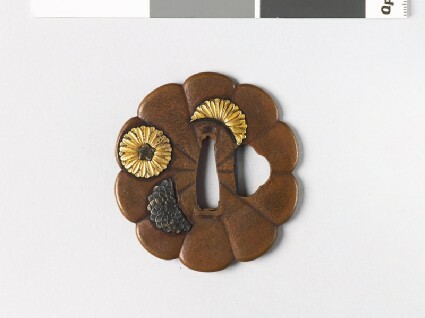 Ten-lobed, representing by means of soft grooves running up to the tang-hole a ten-petalled flower; each face boldly encrusted with three chrystanthemum flowers (whole or part) in gold, shakudō and silver. Hawkshaw Collection, no. 216 (classed as Umetada work in this catalogue).